We already briefly explained differences between plenum and riser cables in this article. However today, let’s delve deeper in plenum cables and debunk 5 most popular myths about it. The plenum is defined by construction contractors, building engineers and air-conditioning technicians as the space between the structural ceiling and a false (drop-down) ceiling, when this space is used for air- conditioning (HVAC), heating ventilation and air circulation. The space between the structural floor and a false floor, e.g. a raised computer room ﬂoor, is also known as the plenum. The plenum is typically used for returning air to HVAC equipment. Raised floors and ceilings are convenient spaces where voice and data cables can be run, but national codes require that plenum cable should specifically be used in plenum spaces. 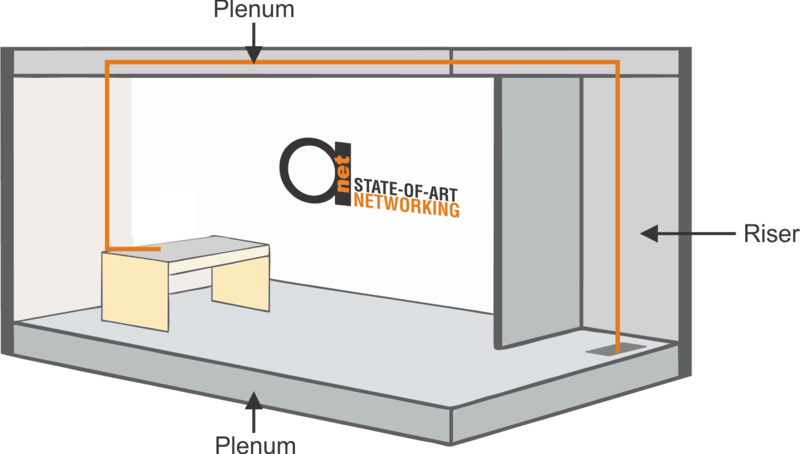 It should also be noted that people often use the word plenum to refer to all ﬂoor and ceiling spaces, whether they are actually plenums or not. This could be an expensive mistake as plenum cables cost up to twice their non-plenum equivalent. Cable designers refer to plenum as the type of cable that is rated for use in plenum spaces. When working with contractors, cabling professionals and building engineers, be aware of when the term is used for cable and when it refers to the air space. Building management and local authorities might at times require that plenum-rated cable be used in non-plenum spaces. You should be aware of the requirements in your area. There are numerous commonly held, but incorrect, beliefs about plenum rated cable. Not only do these misconceptions make discussions about LAN cabling difficult, but they are especially annoying when UTP is discussed. Myth 1: Any space beneath a raised ﬂoor, or false or drop-ceiling area is a plenum, and plenum-rated cables must be used there. Although many people refer to all such spaces as plenum, this is not necessarily true, as a plenum is deﬁned very speciﬁcally as a raceway, duct, or air space that forms part of the air-handling system of an HVAC. Although the raised-ﬂoor or drop-ceiling space is often used as return air passageways, this is not always the case. Building maintenance personnel and the company that installed the HVAC will know for certain. If it is not a plenum space, there is no need to spend extra on plenum-rated cable. Myth 2: You get PVC cables and plenum cables. This is a typical example of sloppy wording being used, resulting in the common misperception that plenum cables don’t have PVC (polyvinyl chloride) and that all non-plenum cables are made from PVC. The fact is that just about all four-pair UTP cables used in the U.S. have a PVC jacket, including plenum cables. It is also true that Category 5e or better cables don’t use PVC as insulation for the conductors, irrespective of its ﬂame rating. A plenum cable actually contains as much PVC as does a PVC non-plenum cable. If you don’t have to specify a ﬂame rating, it’s actually more accurate to generalize about cable flame ratings by saying plenum and non-plenum instead of PVC and plenum. Myth 3: When plenum cables burn, they don’t produce corrosive or toxic gasses. Both in the U.S. and Europe, “clean” smoke is often emphasized. There are therefore many tests that measure levels of corrosive and toxic elements in smoke, but for general residential and commercial use in the U.S., the philosophy on ﬁre safety relating to cables is based on two fundamental principles. The first is to give people enough time to evacuate a building, while the second revolves around keeping exits clear and using signs that indicate where exits are located. The NEC ﬂame-test requirements focusses on tests that measure how fast a fire will spread under varying conditions and to varying degrees. These tests are based on the intended use of the cable. The first part of the philosophy is satisfied as plenum cables delays the fire spreading. As all plenum cables are installed in areas not accessible to the public, the second part is not applicable. As plenum cables are however installed in air-handling space where smoke from burning cables could spread via HVAC fans, the generation of visible smoke is measured by the plenum test. Visible smoke could prevent people from finding exits or cause suffocation. This did in fact happen in major hotel ﬁres before the code deﬁned plenum cables. Myth 4: If you want good transmission performance, you should use plenum cable. Although plenum-rated Category 5e and higher cables use ﬂuorinated ethylene-propylene (FEP) as conductor insulation and it has excellent transmission properties, it is used in plenum cables for its low visible-smoke generation and excellent resistance to ﬂame propagation. HDPE (high-density polyethylene) is used in Category 5e and higher non-plenum cables as conductor insulation. Its transmission properties is almost as good as FEP and it also has the beneﬁt of costing a lot less than FEP. HDPE however generates lots of visible smoke and burns like a candle. Cable manufacturers adjust the PVC jacket of a four-pair cable so that HDPE-insulated cable passes all ﬂame tests except the plenum test. They also adjust for transmission property differences between HDPE and FEP by changing the insulated conductor dimensions. The bottom line is that if a cable is rated as Category 5e or better, it is Category 5e or better, irrespective of the flame rating. Myth 5: You should install plenum cable in your home to protect your family. This is not true for two reasons. Although not impossible, communications cables are seldom the source of ignition or ﬂame spread in a residential fire. Secondly, you should consider to what the “fireproof” cable will be attached. It will most likely be fastened to wooden studs that will burn hot, fast and with poisonous, black smoke. While these burn, the ﬂoor, roof, plastic water pipes, electrical wiring and furniture will blaze away merrily, generating a huge amount of smoke. A plenum cable’s potential to affect the conﬂagration in any way is essentially zero. To comply with the National Electric Code, a CMX-rated cable should be installed. Installing CM, CMG, or CMR cables will exceed NEC requirements. CMP cables are intended for commercial environments and that’s where they should stay.